I started out calorie counting. I’ve done low carb and no carb. I’ve tried to eat clean. I’ve done the competition diet many times. Some of these things even worked! I could do anything for a week or two, or if I had a big finish line goal like a competition, I could even do it for 3+ months. The problem for me was, that as soon as I crossed my finish line, real life hit, or I just got sick and tired of certain foods (seriously never want to eat egg whites and oatmeal AGAIN! ), I began to revert back to old habits. These diets were not sustainable for me! I realized I was not being smart about nutrition and what I was doing to my body for the long term by dieting this way. Also, I found myself having to use too much brain space on what I was supposed to eat! As a busy working momma, I really need to put my brain space elsewhere! I literally have zero brain space left to stress about food! What I really needed in my life was a sustainable EVERY DAY rhythm of eating that didn’t feel like a diet! I’m happy to report that for almost 4 years now, I’ve found my sustainable approach to nutrition! 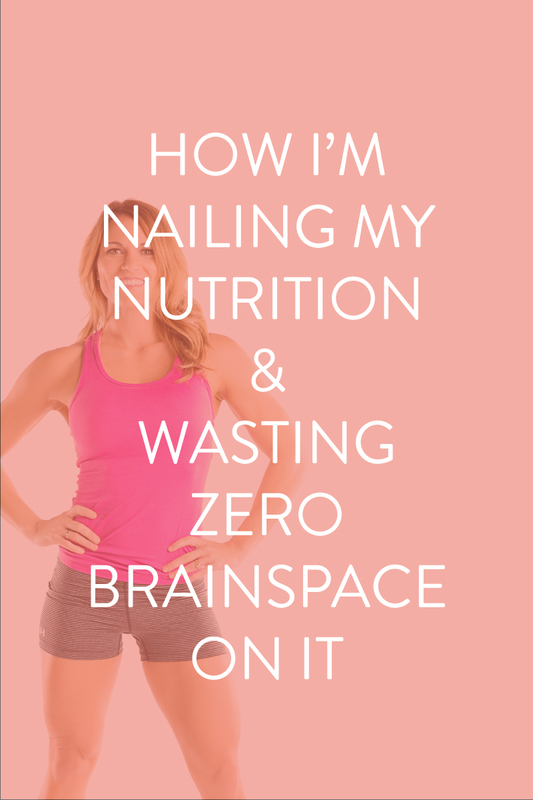 I'm nailing my nutrition & wasting zero brainspace on it! I’m able to stay within 5lbs of my comfortable weight year around and not really give up anything that I love (hello wine and tacos!). I have more mental clarity and energy than ever. I’m spending zero time meal prepping. Getting to a healthy body weight and fueling your body with vitamins, minerals, protein, good fats, etc does not have to consume your brain and your life! I am super excited and passionate about coaching others to rock this lifestyle approach. It’s why you may see me hosting challenge groups inviting you along! I want this for you!!! Check out my latest one here. As a busy mom with so much on your plate, could it be time to join me in a more simple… and better… approach? Breakfast - 1. chug my cortisol leveling superfood 2. take my high quality vitamins for energy, longevity, and mental clarity, 3. chug my high protein + low glycemic carb + healthy fats shake in the car! Snack - whatever I’m gravitating towards with the goal of getting in protein and being smart about it. Dinner with the fam - Whatever I want, but being pretty smart most of the time. Protein, healthy carbs, lots of veggies. Having these shakes around for meal options feels like a safety net to me. For almost 4 years now, my breakfast and lunch is handled! Do I sometimes choose to have something else? Yes! But most of the time I go with what makes me feel the best and keeps me moving towards my fitness and wellness goals - the shake! Another element to my nutrition routine is occasional intermittent fasting/cleansing. Have you googled the weight management, health, and even muscle building benefits of fasting?! Amazing. Wonder if this could work for you? Schedule a 15min call with me here so I can hear about your personal issue and help you decide if this could be right for you.